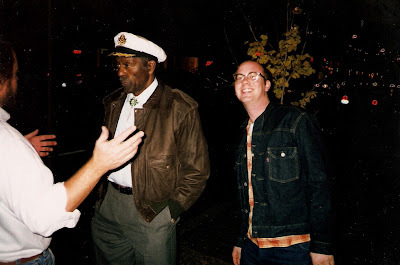 Well, I didn't actually meet Chuck Berry. I was on tour with Deke Dickerson in 1999 and we had a show in St. Louis. 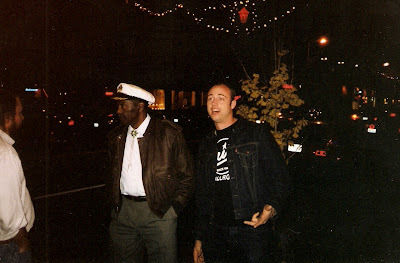 We were having dinner before the show when--all of the sudden--Chuck Berry strolls by on his way out of the restaurant. We all followed him outside to see if we could meet him. I rushed back to the van to grab my camera while Deke was getting Chuck's signature on a five dollar bill--which Chuck jokingly tried to pocket! When I came back, Deke told me "Chuck says we can take all the pictures we want but he's not going to pose with us!" So we went ahead and took a few quick snapshots and I didn't shake his hand or anything. Heck, I didn't even acknowledge him! We just took our pics and left him on the curb while he waited for them to bring his car around.